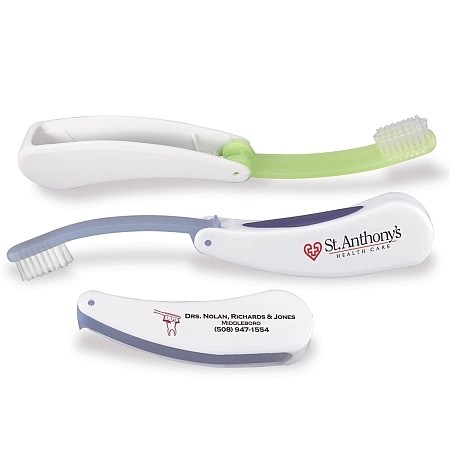 Imprinted Toothbrushes and Toothpaste squeezers Promotional Products to promote hygiene and tooth care for a bright and healthy smile. Custom printed with your slogan or logo will be the liaison and bond with the recipients and a sign that you care for their well being. Promoting healthy habits is an essential step in keeping our community in shape and connected. CUG126 Children love it and adults do too! 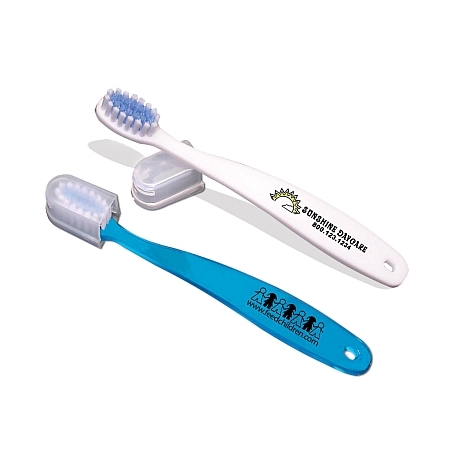 Wide, easy-to-hold handle makes gripping safe and brushing easy; Features softer bristles in an attractive blue and white pattern; Easy-on, easy-off, safety caps provide extra protection for the bristles when not in use. A compact and convenient promo product, traveling package that opens up to create a full-size toothbrush; Ergonomically designed handle features a rubber grip for easy brushing with medium nylon bristles; Individually poly bagged. Note: Unless otherwise specified, imprint will be on side for a right-handed user. For copy on both sides, please add additional-color imprint charges. A perfect promo product for travel agencies and operators, hotels, hospitals and clinics. Size: Folded - 1" x 4" x 3/4"
Imprint Area: 1/2" x 2 1/2"
This miniature promotional toothbrush fits easily in the most crowded travel bags. The wide, easy-to-hold handle makes quick work after a long day; Features softer bristles in an attractive blue and white pattern; Easy-on, easy-off, safety caps provide extra protection for the bristles when not in use; individually poly bagged. Imprint Area: 3/8" x 1 1/4"